Hard to believe, but the Harley Davidson Softail, in its many guises, has been with us for 15 years now. This is the bike that invented retro. This is the bike that rescued HD from the edge. This is the bike that has been the cornerstone of every Japanese copy. This is the definitive modern Harley which outsells all the others, but time marches on and by the time you read this the Evolution engined Softail will be history. 1999 saw the Evo engine disappear from the Dyna and 'Glide ranges, and now Harley has just issued details of the new 2000 year model range. Sure there will continue to be Softails, and they will look pretty much the same, but in reality they will be totally different bikes. New frames which are stiffer and easier to manufacture, totally new brakes which are reputed to be a vast improvement, and most especially a brand new engine. The Twin Cam 88 motor launched with much ballyhoo last year has spawned a new derivative, the 88B which will be fitted to all the new Softail models. The B stands for balancer, because this engine differs in having internal balancer shafts to quell the legendary HD vibe. There will no doubt be a massive publicity campaign to sell the benefits of this all new Softail, and already the first road tests are appearing singing its praises. In today's world it is just an accepted fact that the latest version of anything has to be bigger, faster, groovier, etc. etc. and we all buy the hype and go chasing after whatever is the latest model. I thought that for once I might just challenge this assumption and road test the outgoing bike. After all, if this really is the bike that created the whole retro, look-alike cruiser scene, why should we want it to go faster, stop on a dime and handle like a sports bike. 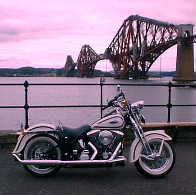 I arranged to borrow a nicely run in example of a classic Softail and check out my theory. Lets ride. The bike I got was an FLSTS Heritage Springer Softail, a bike I always considered way over the top, but once shorn of the downright silly fringed panniers that come as standard, I really started to take to the looks. Get rid of the rest of the fringes and coach lines, take off some of the unnecessary chrome, and you would have a bike that looked like a concours restoration job. Gaudy it may be in its factory war paint and feathers, but this has the makings of one tasty ride. Another important point was that the bike had done 12,000 miles and I know from personal experience that this is the downright minimum for a Harley Evo to even start to feel properly run in. All you folk out there that buy bikes, especially Harleys, and then trade them in with only a few thou' on the clock never actually feel what they are capable of, because they still tight. This one ran like a clock, albeit a loud one on its non standard and decidedly fruity pipes. Not crazy loud, but you could actually feel the engine as well as hear it. Nice. Trickling through Leith I was surprised at how good the ride quality was on the city potholes, those big chrome springers work better than I had expected. Like all the big 1340 Harleys it was also amazingly easy to ride in town, and I can think of lots of smaller bikes that are much more of a handful. The unarguable benefit of a real low centre of gravity. Feet up U-turns no probs. Very positive gearchange, great throttle sensitivity, dead comfy, and no vibes. Why all the moans about vibrating Softails, this one felt like a peach. This was an opinion that lasted for as long as it took to reach the motorway towards the bridge! Open it up to get up to the legal limit and the whole character of the bike changes, and not for the better. Being an open cruiser you are in the wind like an unfurled spinnaker, and boy do you know it. Get up to 70 mph and the vibes start to build thick and strong, till industrial white finger, blurred vision and an anaesthetised bum become real possibilities. Sure the bike will pull like a train, but you get the feeling that this is just not its natural habitat. That springer front end loses its feel of the road, and that cleverly styled hardtail rear just does't have the travel and the articulation to make you confident. Head into even mildly illegal speeds and the whole feel good factor vanishes, and you are left hanging on with little or no sense of being in control. Not good, so you do the obvious, cut the gas until you are back down to a speed the bike likes, even if you don't. But then the plot comes back! You suddenly realise that whoever invented the American 55mph speed limit must ride an FLSTS, 'cos at 55 she just clicks into a groove and sings. A smile breaks out on my face as the world tears past me while me and my Softy just get funky with it. I am reminded of something Rolls Royce used to say in their adverts, that one did not merely drive a Rolls, one progressed a Rolls. It holds with this Harley too, push it hard and it just feels all out of sorts, but settle back and progress and the world feels mighty good. I get off the motorway and wind down some A and B roads, at speeds that are respectable but won't break any lap records, and again the bike just feels the part. The Evo engine gurgles away like an old Pratt and Whitney radial aero engine, and at the sort of RPM figures that would be tickover for a 'Blade. The lousy brakes that you have heard so much about pull me up without a murmur, and the handling is exactly what you would want from a cruiser. Believe me, ride one of these on good roads on a sunny day with no particular place to go and it's a better prescription than a skip full of Prozac. Everyone who loves bikes should try a Harley at least once. It may not be for you, but you are missing a unique experience. All of which brings me back to where we started, namely that these charming old bikes are about to be replaced with faster, sportier ones. But will they be any better? I have real doubts, on today's GATSO infested roads any bike that can have you grinning and humming to yourself inside your helmet while never doing much above 55 mph has to be something very, very special indeed. I know that legislation on noise and pollution mean it is inevitable that Harley must update their products, but I hope they don't lose what they have got here. Console yourself with one last thought. If you can't afford one of the new Harley Softails when they come out, maybe a good used '84 to '99 model might be a better bet ... and half the price.